The Brittleness Scale was devised by Allan Savory, creator of Holistic Management®, a decision-making method for land restoration, livestock and range management. Savory is a biologist and conservationist who has developed a system using livestock grazing and herd movement to restore and maintain healthy rangeland. Savory classified landscapes on a scale from Non-brittle (tropical) to Extremely Brittle (desert) representing varying characteristics of land, moisture, vulnerability to mismanagement, existence of dry spells during growing seasons, and other factors. 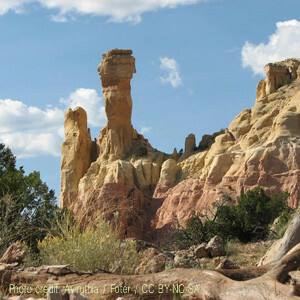 This scale is useful in understanding the particular nature of northern New Mexico’s landscape, and how to encourage healthy land management even on a small scale such as a residential site. The key to Savory’s method is to understand that Brittleness refers to the periodicity and prevalence of rainfall and humidity in a landscape, not the amount of rainfall and humidity. Deserts can be healthy ecosystems with plants and animals specially adapted to their climate, so low rainfall does not necessarily mean that a landscape is unsustainable or unhealthy. Yet deserts are considered extremely brittle because most of the rainfall occurs within a short period of time at one time of year with little humidity throughout the year. They may also be exposed to strong prevailing winds (lack of vegetation for windbreaks), and have a slow or non-existent nutrient cycles (no consistent moisture to encourage decomposition which returns nutrients to the soil). 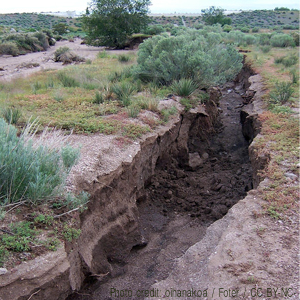 A brittle landscape, such as a desert, is vulnerable to degradation if managed poorly or used badly. Learning how to work with a brittle landscape can give you an edge in establishing healthy gardens or combating erosion.